Dare to Repair, Replace & Renovate: Do-It-Herself Projects to Make Your Home More Comfortable, More Beautiful & More Valuable! About us: Hi, my name is Pam. 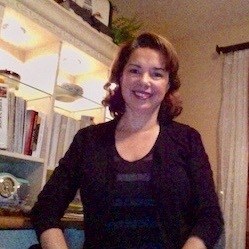 I'm sharing my sewing projects, home improvements, gardening tips, party ideas, recipes. and all sorts of fun and creative DIY's. I couldn't do it without my creative, talented family. They help me out with their skills and imagination. My husband, nephew, daughters, friends and I have a great time coming up with fun ideas and then executing them. Much of what I share are projects we are already doing, but every now and then, we make up DIY's just for the fun of it. 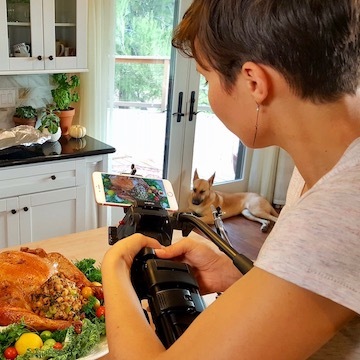 Sky photographing our "Best Stuffing Recipe" video. It helps to have a video expert in the family. My oldest daughter Sky is an amazing filmmaker. Although I do most of the filming and editing, she assists me with her expert advice and teaches me the tricks of the trade. When I started this website in 2009 I knew nothing about filming and editing videos and photos, and it shows in the early videos, but things have come a long way since then. My youngest daughter Sierra is the model for many of the costumes and other DIY's. She helps me with social media and working out technical issues. She also pitches in with editing, filming, preparations, and pretty much whatever is needed. Meet Otis & Lucy. They can be scene throughout our DIY's. Many of the photos throughout theDIYeffect.com are photo-bombed by Otis and Lucy (our dogs). 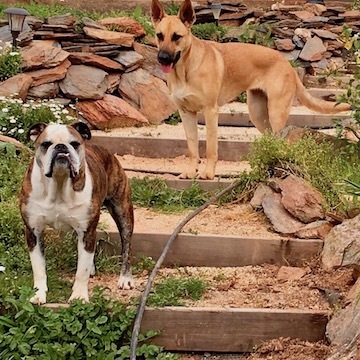 Otis is an Olde English Bull Dog, and Lucy is a rescue dog of mixed breeds (probably Anatolian Shepherd). They are loving and adorable, but you don't want to mess with them if you don't know them. They love swimming, running and fetching. If you'd like to see Otis's life story, check out "Bull Dog Photos" for more on Otis's career, favorite sports, and hobbies. These two keep us entertained and on our toes. They love to be in the middle of everything so they will be fixtures at thediyeffect.com. My nephew Colt is a creative genius. He helps with props, set designs, filming, recipes, some on camera, and just about anything we need. He builds whatever we need, and is always ready to help with putting things together behind the scenes. His creativity is off the charts! Also invaluable to the team is my husband Andy and our dear friend Spider. Between these two, there's little we can't overcome. They build, problem solve, and help bring it all together. I feel privileged to have such a great team of exceptional people. True, I may be a little partial, but regardless of how things turn out, we have a great time doing it all. I do admit we have our issues. Sometimes things take longer then expected or things aren't turning out as planned and crankiness can develop, but for the most part we have a blast! Join us and we will try and make it worth the visit. Check out our "DIY Blog" for updates on our DIYs . Subscribe for free e-zine: recipes, sewing, remodeling projects, and pretty much whatever were doing. Update Much has happened since I started this website in 2009. A big move to the country, lots of remodeling, gardening, experimenting with recipes, party planning and parties are just some of the activities keeping our family busy. Living in the country is full of new, exciting things to do and discover. Our life is full of DIY's, and that's how theDIYeffect.com was born. For more info about this site, and all the people behind it, check out the "about us" page.Enjoy!